The OverDrive Thunderbolt from Monster Digital has a simple-yet-clever design: the gap between the two aluminum halves of the case serves as a hiding space for its tethered Thunderbolt cable. On the top half of the drive below the laser-etched Monster logo and product name is a small LED that blinks blue when the drive is being accessed. 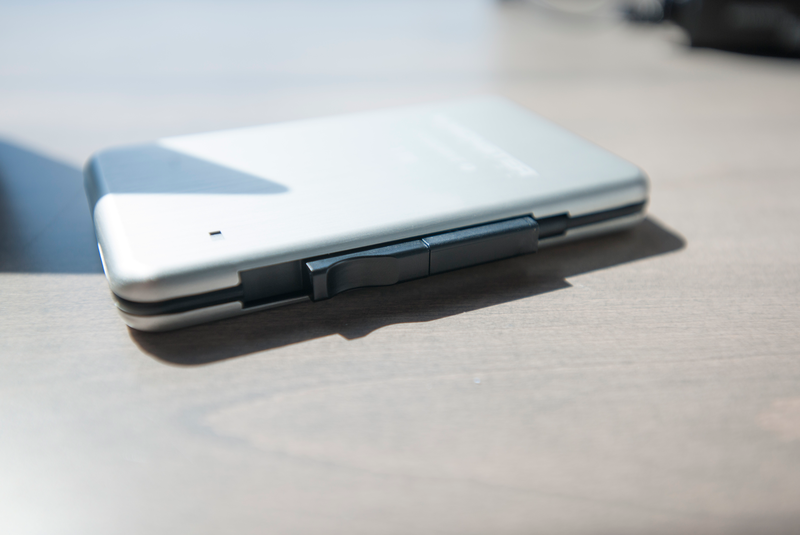 A spring-loaded sliding latch keeps the cable secure when the OverDrive Thunderbolt is not in use. A captive Thunderbolt cable runs along three sides of the drive. To release it, you pull down on a spring-loaded latch to free the cable. Replacing it is simple: just tuck the end of the Thunderbolt cable back into its notch while you hold the latch down, and release the latch to lock it in place. A captive cable is a potential weak point for any drive, but if you tend to forget to bring cables with you, the captive cable will save you time and hassle. Subtle vents along the edge of the OverDrive Thunderbolt helps keep its internal temperature down. With the cable removed you can see perforations in the groove. These are vents meant to help keep the drive cool while in use. The OverDrive Thunderbolt does get pretty warm during operation, but it's not uncomfortable. 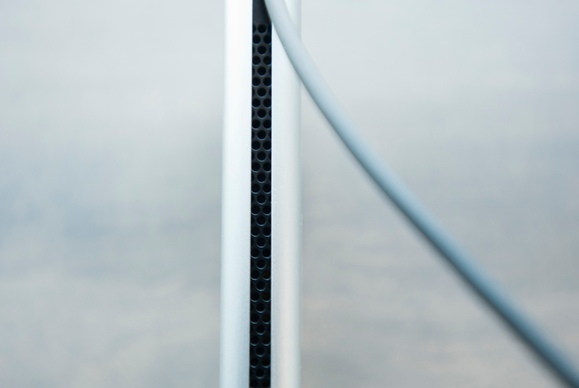 Tucking in the Thunderbolt cable helps keep debris out of the vents. 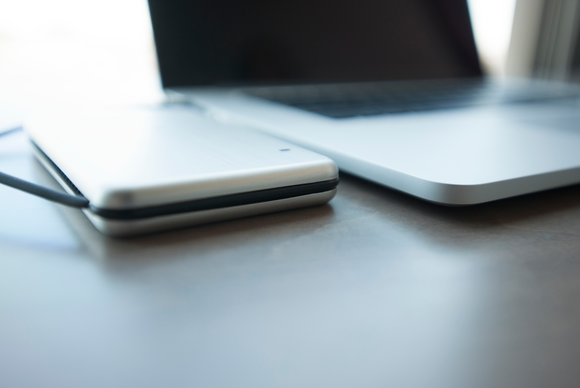 The OverDrive Thunderbolt is just a little bit thinner than a (closed) 15-inch Retina MacBook Pro. At 9 inches long, the captive cable can reach Thunderbolt ports on all Mac machines quite comfortably, so long as your computer is on a flat table. In some situations you might have to leave the drive balanced on end or dangling from the Thunderbolt port. You could also attach it to a Thunderbolt hub, or the end of a daisy chain if you have the hardware. The OverDrive Thunderbolt performed consistently well in our suite of real-world tests and synthetic benchmarks. This isn't entirely surprising given the 1TB capacity (SSDs tend to offer better performance as the storage capacity increases) and accompanying $1000 price tag (you get what you pay for)—a dollar per GB isn't outrageous for a portable SSD right now, and at 1TB there aren't many others to choose from. With a three-year limited warranty and three years of free data recovery, the OverDrive Thunderbolt is designed to last. Data recovery is typically very expensive and considering the drive doesn't seem to be user serviceable in any way, the warranty and data recovery service are a nice touch. The OverDrive Thunderbolt is a portable drive that's sure to meet the needs of anybody looking for a lot of fast, solid state storage that you can take with you. With so few portable SSDs sporting a terabyte of capacity, the OverDrive Thunderbolt stands out, in a good way. Final thought: a USB 3.0 port would have been a nice addition. 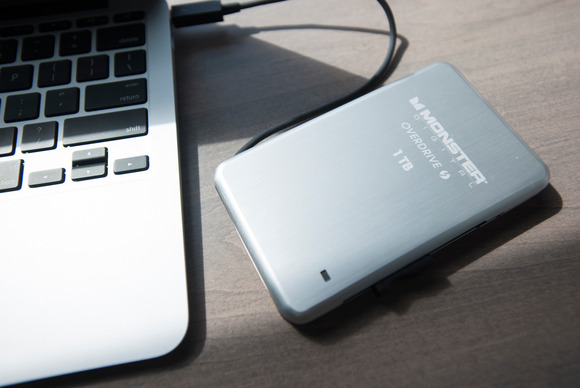 The OverDrive Thunderbolt from Monster Digital might be expensive, but this 1TB solid-state portable drive's speeds won't disappoint and comes bundled with free data recovery protection.